Athens, Greece – birthplace of the Olympics, democracy, Western philosophy – and killer boutique effects. Under the aegis of Christos Ntaifotis, Crazy Tube Circuits has been building pedals since 2005 with the goal of not just cloning classic designs, but adding a twist. Christos recently sent us three of his pedals – the Splash MKII reverb, the Pin Up fuzz/octave, and the Stardust overdrive. All have heavy duty die-cast housings with nicely executed high-gloss finishes, chassis-mounted jacks, switches, and pots, and true-bypass footswitches. 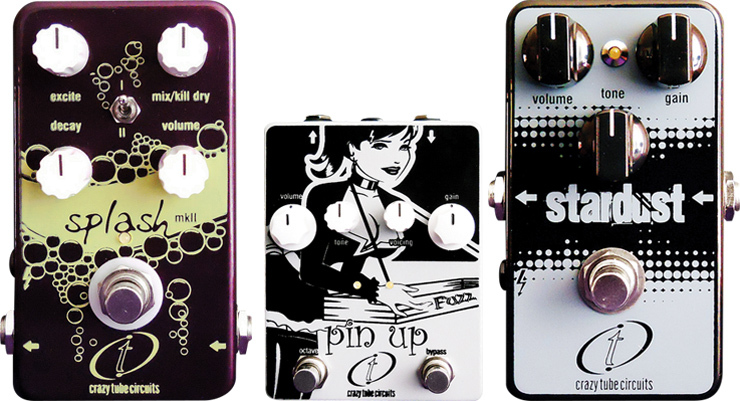 The Pin Up fuzz/octave pedal has controls for Volume, Tone, Voicing, and Gain, as well as footswitches and LEDs to operate the entire circuit and/or a separate one for the octave effect. Using a Gibson Les Paul Standard plugged into an 18-watt tube head and 1×12 cabinet, and with the Fuzz and Octave both engaged, we got a very percussive fuzz effect with aggressive-but-smooth pick attack and loads of sustain. Engaging the neck pickup and rolling back the guitar’s Tone helped coax a synth-like sound, yet still offered excellent tracking and a smooth, creamy tone. The pedal’s Tone control boosts/cuts high frequencies, while the Voice control either scoops or adds midrange to the effect. Both are well-voiced and smooth, and between the two, you can dial in nearly any fuzz sound from classic thin-and-scratchy to a thick, round overdrive-meets-fuzz tone. Click on the Octave switch for even more otherworldly octave/ring mod tones. Even with the gain piled on, note separation and attack remain. The Splash MKII reverb uses a control labeled “Excite,” which adds harmonics and presence to its high-frequency sounds, a Decay for reverb time, Mix/Kill Dry for wet-to-dry balance, Volume to overall output, and a two-position toggle to engage its reverb algorithms (which have a couple of preset pre-delay/decay choices). Both algorithms are complex and natural-sounding, with lively, yet warm decay and rich clean highs that don’t sound sterile or cold and digital. Excite does an excellent job adding presence and clarity to the reverb’s high-end without sounding artificial or brash. It’s much more interactive than your typical high-frequency roll-off control. We used the Splash MKII through the effects loop of the amp head, where it added very little (if any) noise to the signal. The pedal’s Volume control compensates for any lost headroom – a well-conceived feature. While the Splash doesn’t necessarily have a spring-reverb sound, its verb blends very well with guitar and doesn’t wash out the amp/guitar tone, even when blended heavily. The Brit-voiced Stardust overdrive has a straightforward control scheme, with Gain for the amount of overdrive, Tone to control the high frequencies, and a Volume to control overall volume. It renders a moderate amount of gain with a smooth midrange boost with a nice, percussive quality. Single notes pop and chords are super crunchy, á la Mick Ronson’s famed tone with David Bowie some 40 years ago. The subtle-yet-effective Tone adds a bit of presence and bite without getting harsh or scratchy. Overdrive pedals, by their nature, tend to sap low-end response from a guitar’s signal, but the Stardust’s low-end is fairly transparent, and keeps the sound full and round, even with the Gain dimed. 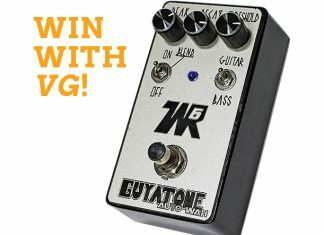 All three Crazy Tube pedals offer great build quality, top-notch features and tone, as well as unique personality and vibe. This article originally appeared in VG February 2013 issue. All copyrights are by the author and Vintage Guitar magazine. Unauthorized replication or use is strictly prohibited.